Note: Right now it looks like boots do not go over these pants but instead they cut off at the ankle and bulge out. It’s more obvious with chunkier shoe styles. Note: There does not seem to be a “Cargo pants, yellow” version for men like there is for women. 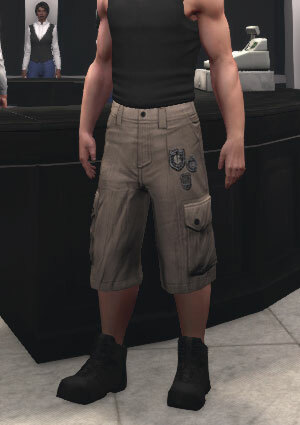 Note: Same style is available as “Cargo shorts” in blue, green and red from the Whispering Tide event vendor. Note: It’s hard to see in the screenshot since the “blue with dirt” pants are a dark navy blue, but the “dirt” is a liquid splatter on the front & back of the legs at knee level. It’s similar to the dirt marks to the “grey with dirt” pants. Price: 25,000 Pax for black; 3,000 Pax for all other colors. Note: The Suit pants, dark grey have been updated to a dark grey skin instead of the previous white with blood splatter texture. The blood splattered pants are not longer available in Pangaea.